It shares recognition of the music industry as that of the other performance awards such as the Academy Awards (film), the Emmy Awards (television), and the Tony Awards (theater). 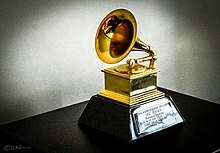 For years, the Grammys were usually held on the second Sunday of February, with two exceptions: if that day was February 14 (Valentine's Day), it was moved to the following day; if it was a Winter Olympics year, it was held earlier on the last Sunday of January. In 2020, the Academy Awards moved their ceremony back to the second Sunday of February, forcing the Grammys to move theirs back to the last Sunday of January to avoid a conflict with either the Oscars or the Super Bowl on the first Sunday in February. The change of date means that the cutoff date for eligible recordings will be the last day of August, rather than Sept. 30 day, which was the last day for submission prior to this change. This change means eligibility period is 11 months, starting Oct. 1, 2018. ^ "Explanation For Category Restructuring". GRAMMY.com. April 5, 2011. ^ "See The Full List Of 60th GRAMMY Nominees". GRAMMY.com. November 27, 2017. Retrieved December 8, 2017. ^ "When are the 2018 GRAMMYs?". Grammy.com. May 9, 2017. Retrieved December 30, 2017. ^ Luling, Todd Van (February 15, 2016). "The Grammys Are Even More Terrible Than You Thought". Huffington Post. Retrieved July 24, 2017. ^ "Drake Won't Be at the Grammy Awards". Billboard. Retrieved July 24, 2017. ^ "The Internet Is Calling Out the Grammys With #GrammysSoMale". Time. Retrieved April 6, 2018. ^ "Ariana Grande slams Grammys producer and accuses him of lying". CBS News. Retrieved February 8, 2019. ^ Lewis, Randy. "With 2020 Grammy Awards moving to January, eligibility deadline is pushed up a month". latimes.com. Retrieved April 23, 2019.